Vilebrequin polo shirt in terry knit. 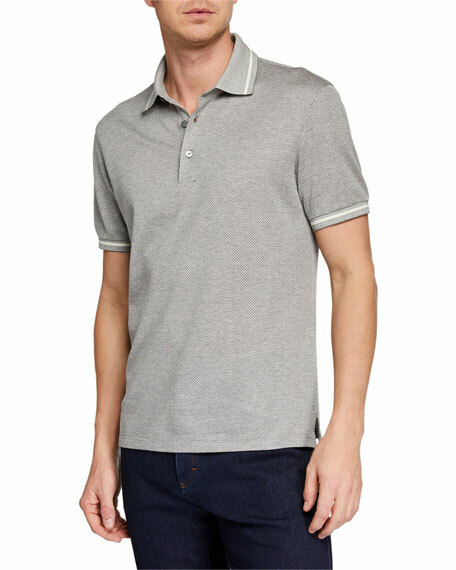 Moncler polo shirt with striped neck-applique. Approx. 28"L down center back. Spread collar; two-button placket. Straight hem. Cotton. Machine wash. Imported. Rag & Bone "Owen" polo shirt in heathered knit. Spread collar; two-button placket. Short sleeves. Railroad stitching at seams. Slim fit. Straight hem. Linen. Imported.